Here is an example of the way the Elgin Military Museum brings innovative thinking to education programming and makes learning fun. Expect the unexpected from us! The following was an April Fool's Day press release that takes the opportunity to draw unexpected comparisons - albeit with a little tongue in cheek! All the while, it outlines some of the potential on offer in our education programming. Executive Director Ian Raven announced today that the Elgin Military Museum is considering the purchase of a Hippopotamus. Raven was quick to quash expressions of doubt by stating, "This great beast has many similarities with Oberon class submarines such as our own HMCS OJIBWA, indeed Hippos are related to whales and dolphins. A hippo would also make a fine companion for the two kangaroos we already own and the close proximity of the Jumbo the Elephant monument only adds to the interest for the visitor." One is very good at smelling and the other smells - especially after a long operation. 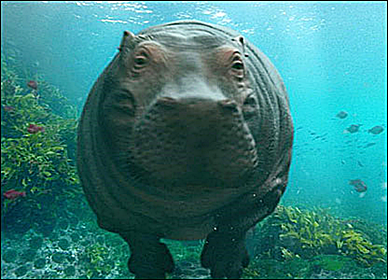 Both are more agile than they appear = hippos can run up to 30 mph and would be neck and neck with a submarine in a race. Both often carry riders - hippos carry birds; subs, carry special forces - aka spies. Hippos can hold their breath for five minutes or longer when submerged. Humans only wish they could hold their breath for five minutes when encountering a cold war submariner just returned from a mission. Hippos fling their dung / submariner dung can be flung about if the submarine has a sudden increase in pressure due to a quick dive. While the matter is still under review, Raven said that the synergies with the museum education program helping to illustrate how humans, animals, amphibians and machines can function in the underwater world were well worth taking the discussion to the next stage. Hippos also have a set of built-in goggles: a clear membrane covers their eyes for protection while still allowing them to see when underwater. Submarines have periscopes to see and induction masts to bring air into the boat. 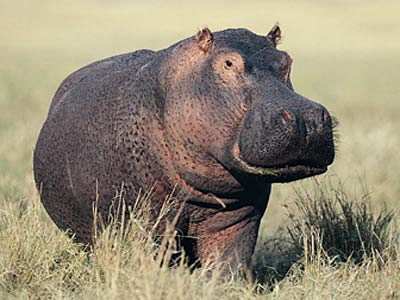 Hippopotami seem to communicate verbally and they may use echolocation similar to how sonar is used on a submarine. Even more interesting, is a hippo's ability to communicate above and below the water simultaneously by holding their head partially above the water when they send out a cry; hippos above and under water will respond. Unlike most of the sonar on the submarine, the hippo has only one 'transmitter' (mouth) and two receivers (ears). William E. Barklow (2004). "Low-frequency sounds and amphibious communication in Hippopotamus amphibious". The Journal of the Acoustical Society of America 115 (5): 2555.